A 32 year old healthy female with no past medical history presents to the emergency department with left sided flank pain x 2 days. A bedside ultrasound of the left kidney is performed, what is the next best step in management? 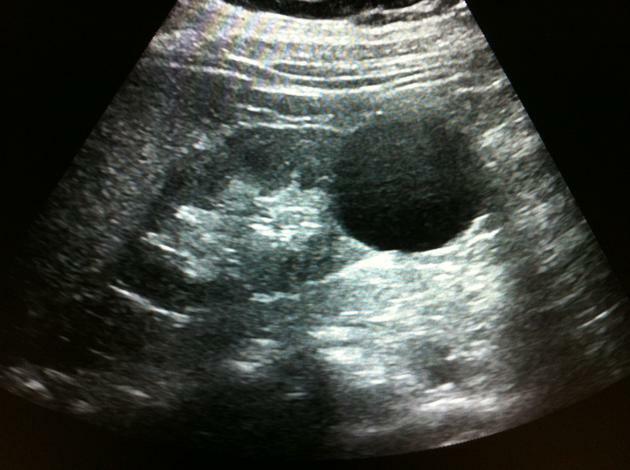 The ultrasound image demonstrates a simple cyst located in the cortex of the kidney. The cyst can be described as anechoic, homogenous, with thin and smooth walls, and would be a type I lesion according to the Bosniak classification system (image below). There is no evidence to suggest obstructing hydronephrosis. 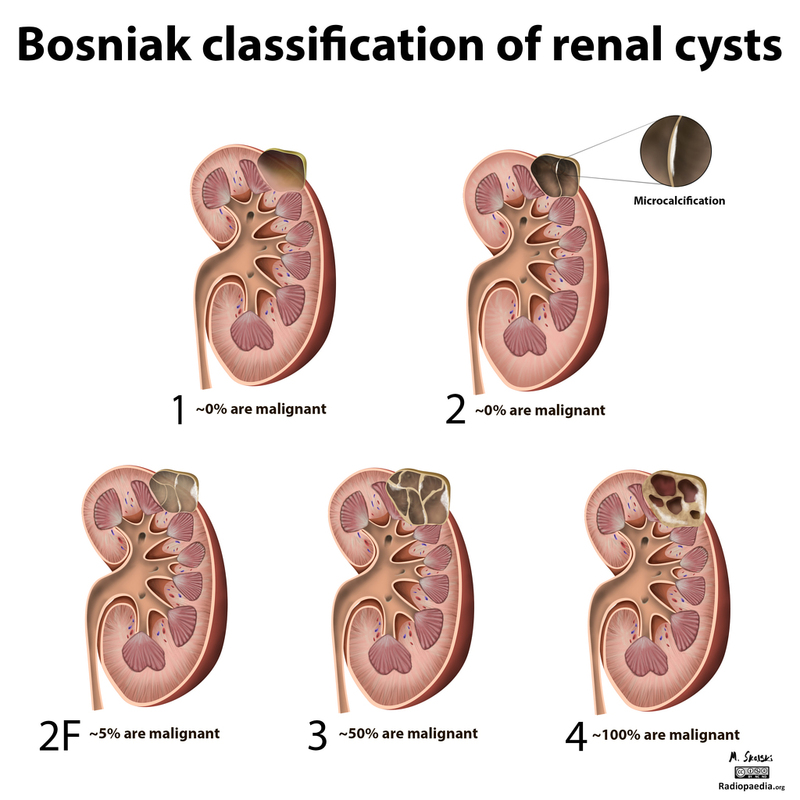 The Bosniak classification for renal cysts was developed in the 1980s as an attempt to standardize the description and management of complex renal lesions. Based on classification of the renal lesion, the likelihood of malignancy can also be predicted. While the Bosniak classification was initially described and validated with CT imaging, newer data suggests that ultrasound may be sufficient to follow renal cysts that are minimally complex (Bosniak I & II). Given the bedside ultrasound demonstrates a Bosniak I lesion in the left kidney, the patient can be reassured that this finding is very unlikely to be malignant and she can be referred to a primary care provider for follow up in several weeks for formal outpatient renal ultrasound. Incidental findings are frequently found on point of care ultrasound and while most of them are benign it is of utmost importance to ensure proper follow up when identified. Specifically with renal cysts, this is a common occurrence and most can be followed with renal ultrasound as long as they are simple (Bosniak I or II). One pitfall to be aware of is that renal cysts can be mistaken for hydronephrosis and lead to unnecessary imaging and work up (especially in patients presenting with acute flank pain). Therefore it is critical to note the differences between a simple renal cyst and hydronephrosis. As seen in the comparison above renal cysts tend to (but not always) be located in the renal cortex and are both spherical and very well circumscribed. On the other hand, hydronephrosis is centrally located, and tends to branch outwards like a tree. If there is uncertainty, I recommend performing evaluation in both transverse and longitudinal planes to fully characterize your finding. The opposite kidney in the patient can also be used for comparison. This post was written by Michael Macias, MD, Ultrasound Fellow at UCSD. 1. Muglia VF, Westphalen AC. (2014) Bosniak classification for complex renal cysts: history and critical analysis. Radiol Bras 47(6): 368–373. 2. McGuire BB, Fitzpatrick JM. (2010) The diagnosis and management of complex renal cysts. Curr Opin Urol 20:349–354.